February is the shortest month of the year, just a mere twenty-eight days this year without the bonus of a leap year day. So not too long to wait for one lucky recipient of our latest competition. This month we have teamed up with Netgear to offer up a fantastic prize! We are giving away one of their new home WiFi systems (RRP £399.99)! Utilising three signal frequencies to make connection within the home stronger, and more reliable, Orbi can transmit a signal over 4,000 square feet – through WiFi barriers like walls, stairs and doors. Orbi can achieve this and still remain secure, which is just as important as keeping your WiFi connection stable. A common issue amongst modern setups is buffering. Often devices interrupt one another from receiving a signal, creating deadspots. No surprise that In this day and age though NETGEAR don’t believe in buffering. Buffering shouldn’t be a part of family movie night or enjoying a gaming session with your mates. Orbi helps prevent buffering and lag by creating a high speed Internet superhighway for all of your devices. 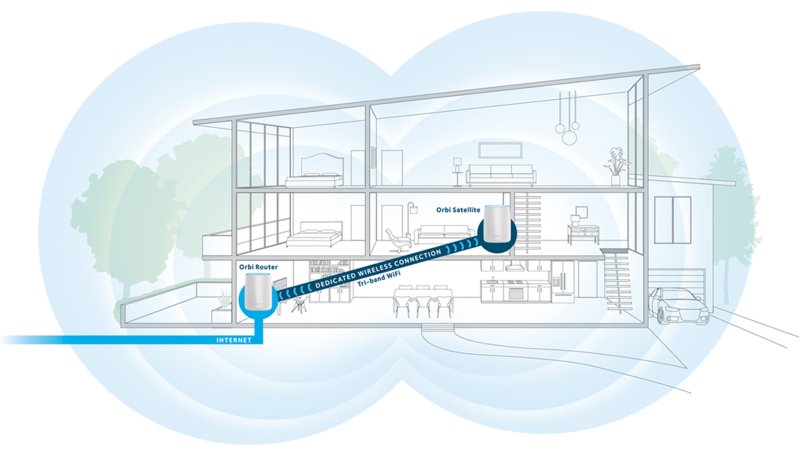 Orbi Tri-Band Mesh WiFi System works with your current ISP’s modem to maximize the speed you are paying for, to every inch of your home and beyond. Unlike some Home WiFi Systems, Orbi works with your Internet service provider right out of the box without needing to change your current equipment. Orbi uses a single WiFi name (SSID) and with just a couple of clicks, your secure WiFi network will be ready in no time. NETGEAR does not require you to sign up for an account to use the Orbi Home WiFi System. No surprise that Netgear have got the design of Orbi spot on! Orbi’s sleek design and state-of-the-art technology steals the show. While other WiFi systems need at least 3-4 units to cover your whole home, Orbi gets the job done with 2. Heaped with praise and awards, PC Mag said “…the Netgear Orbi RBK50 is our top pick for home Wi-Fi systems” Orbi is the new kid on the block for all of your wi-fi needs. So how do you can you enter our latest competition ? Entry as always is dead easy. Simply Like us on Facebook and post #Netgear . You can also skoot over to Twitter and follow and retweet #Netgear. You can then keep in touch with us and join in the fun and competitions and all manner of things! The good news does not stop there. With our Orbi Netgear competition the lucky winner will receive a full home setup; including the NEW Orbi Router and Orbi satellite receiver. So do not delay and the very best of luck!